9 inch unbaked pie crust, homemade or refrigerated** I used a deep dish and had extra room. Lay the walnuts on a rimmed baking sheet and bake for 8 minutes. Let cool, then chop. While the walnuts are toasting, melt half of the stick of butter. Chop up remaining stick and stir it into the hot butter until completely melted. Let cool completely. In a large mixing bowl, stir together the flour, sugar and salt. Add the lightly beaten eggs and stir well, then stir in the melted cooled butter, bourbon and vanilla. 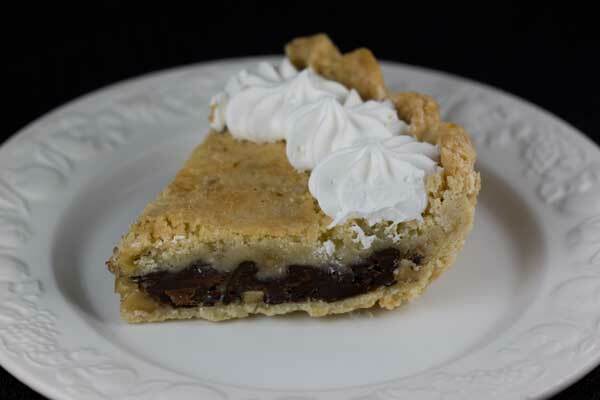 Spread toasted walnuts and chocolate chips across bottom of partially baked pie crust, then pour filling over the top and spread to the edges. Set pie on a rimmed baking sheet and bake for 40 to 45 minutes or until it appears set. Let it cool completely. Garnish with whipped topping or whipped cream before serving. To partially bake refrigerated pie dough, line dish, cover with foil, weigh down with pie weights and bake at 375 for 10 to 12 minutes. If you'd prefer homemade dough, use that.. I used the following recipe: 1 ½ cups flour (210 grams), ½ teaspoon salt, 1 tablespoon sugar, 10 tablespoons (120 grams) shortening, 2 tablespoons lightly beaten egg, ½ tablespoon vinegar, and about 1 tablespoon of ice water. Mix the flour, salt and sugar in a bowl. Cut in the shortening until crumbly. Stir in egg and vinegar, then add enough water to moisten dough. Shape into a ball. Chill for 30 minutes. Between two sheets of parchment or wax paper, roll into a large circle (about 13 inches). Peel off top parchment and carefully invert over pie dish. Press into dish to line it, then carefully peel away paper. alternatively, you can just roll the dough out onto a floured surface, lift it and line the dish.